I’ve always been a bit of a fair weather golfer. I’ve never enjoyed playing golf in inclement weather. I really don’t enjoy the hassle of waterproof clothing, umbrellas, wet grips, damp feet or the general misery of seeing a round fall apart (which is generally the way with my golf) wishing I was somewhere else. Somewhere warm and dry. Don’t get me wrong, I enjoy playing golf. Up until recently, it’s been my primary escape outside work. A few hours in the fresh air, enjoying the best of what Mother Nature has to offer. It’s just that I prefer it in shirt sleeves rather than oilskins. Not my favourite way of spending an afternoon! Given there is a Scottish winter between me and the Euro City Cycle, I need to “Man Up!” on a number of fronts. One of the important ones is braving the elements to get the miles in. I could be a wuss, and do all my winter training on the Turbo Trainer in the garage, but there’s nothing like actually being out on the bike dealing with the gradients, the road conditions and the elements. As my sessions get longer it may also get a little tedious despite the distraction of the Sufferfest videos. So, I’ve made a pact with myself to get out despite the weather (assuming it’s safe to do so, of course!). This morning was my first test… the weather was dreich* to say the least. I’m proud to say that I got up and out anyway and did a solid solo 13 mile ride. I headed to the Railway Line for the ride again. One of the benefits of a miserable morning was that it was quiet. It seems that only dog owners were willing to brave the elements – even the few runners that were out seemed to have dogs in tow. 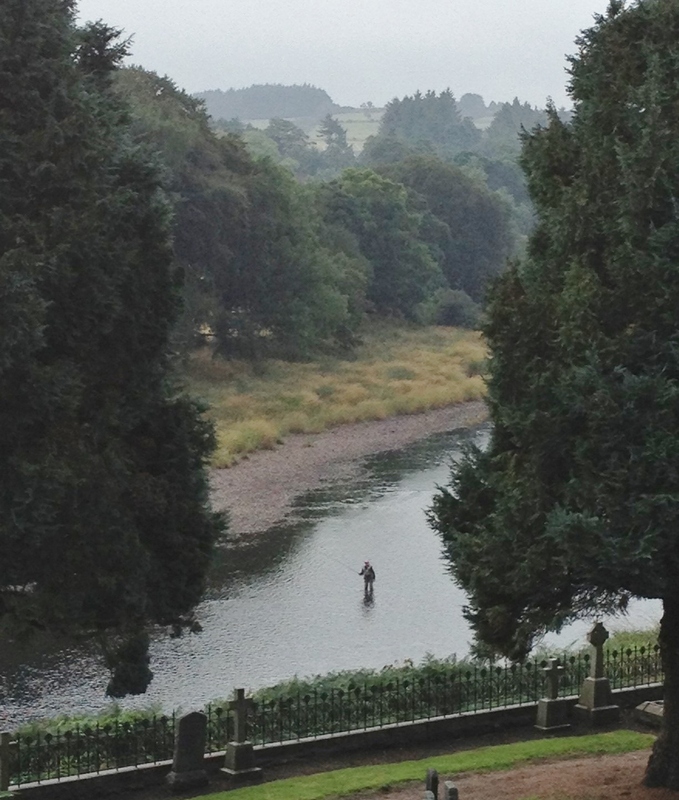 I say only dog owners, but I don’t strictly have evidence to back this up as I did spot a couple of other sportsmen doing their thing… standing in the middle of the River Dee, fly fishing. Good Luck to them! Dreich, but a beautiful morning for catching fish! Don’t let the weather get in the way of doing the things you want to do! * Dreich: A combination of dull, overcast, drizzly, cold, misty and miserable weather. At least 4 of these adjectives must apply before the weather is truly dreich. This entry was posted in Cycling, Exercise & Fitness and tagged Bike ride, Cycling, Dreich, Exercise, Fair weather golfer, Fitness, Golf, Man Up!, River Dee, Scotland on September 7, 2013 by Paul Squire.